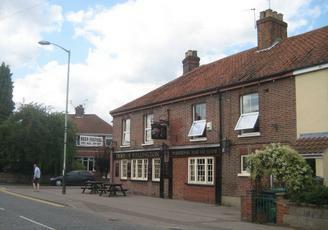 This pub is well worth the visit when your in town.... its not near the centre, but well worth the trip. The ales were tip top, the staff friendly and it was a top night out... loved it !! Another true local that boasts 14 real ales served from gravity behind the bar and a further 7 handpumps. The pub is run by wolf brewery with 4 wolff beers available and one always at £2.50. Oakham ales always available which is good for me as they are my favourite. Nicely priced only 15 mins walk from the city. Always a warm welcome from the staff and a exceptional team in Dougie, Bernie & Simon who obviously know how to keep a decent pint. Folk band every tuesday night, monthly quiz night on monday night. A selection of £2 a pint on wednesdays. You can order a takeaway and the pub provides plated and cutlery. Real pub fire in winter and annual beer fest in summer selling over 70 ales in a week! Been here a few times, most recently for a beer festival. I really enjoy it, seems to be a pretty friendly kind of place with loads of beer from which to choose. I think this is a real humdinger of a place with a fantastic range of ales and served up in a friendly and welcoming atmos. Well worth the schlep from the town centre. i remember when this pub was a ol boozer small and limited. now it has a big range of ales and beers and has been enlarged.